"Platte River Waterfront for Sale - Mary DeWitt"
Specialized Site for Platte River providing All Platte River Listings, helpful resourses, and general information on the Platte River. Search for your favorite riverfront property, save the search or save your favorite listing and return to see any changes in price. This site gives buyers what they want while providing seller's an outlet to feature their property on a specific search matching their listing. 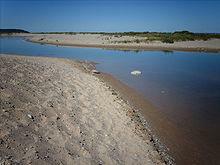 The Platte River is a short river in the northern part of the Lower Peninsula of Michigan. Its mouth is located in Sleeping Bear Dunes National Lakeshore and much of the rest is in the Pere Marquette State Forest. The Platte River is about 28 miles in length from its origin in Lake Dubonett. The watershed area is about 193 square miles. The land coverage is 82% forested, open lands or wetlands; 12% agriculture, and 7% urban. Approximately three quarters of the watershed is publicly owned lands. Water in the river is clear due to extensive wetlands. Mixed conifer and hardwood wetlands give way to tamarack and arborvitae swamp near Platte Lake. The Platte River originates in Lake Dubonett flowing west and eventually turning north, flowing into Mud Lake and then into Lake Ann. From the east, additional drainage into Lake Ann comes from Ransom Creek, which drains Ransom Lake, and in turn Bellows Lake and Lyons Lake. From Lake Ann, the Platte River run west and south. It collects the outflow of Upper and Lower Woodcock Lakes then flows through Bronson Lake. The river continues southwest. The Platte River State Fish Hatchery is on the river at Platte Creek, Michigan and Brundage Creek joins the river just to the east. The main branch receives Collison Creek just east of Honor, Michigan. At the Platte River Campground in the state forest, the river turns north west flowing toward Platte Lake.